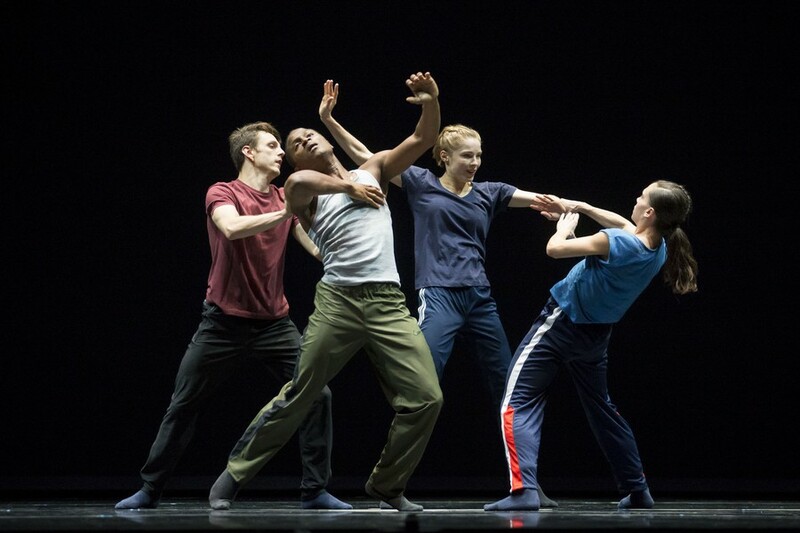 Hubbard Street dancers perform in the American premiere of Forsythe's N.N.N.N. Hubbard Street Dance opened their last season with a show that mesmerized and surprised audiences. This fall, they did it again. Hubbard Street has recently taken to staging entire series based on the work of only one choreographer, an uncommon and somewhat risky move even for such a well-established company. Season 38 opened this past weekend at the Harris Theater with a fall series entirely choreographed by William Forsythe. The conclusion of season 37 last June featured three pieces by Hubbard Street’s resident choreographer Alejandro Cerrudo. The result was a strong but chronically repetitive show, with surprises few and far between. However, Forsythe’s series was far from monotonous. Each of the three pieces stood independently and left the audience with something new. Of course, Forsythe is no up-and-coming artist. The award-winning choreographer got his start dancing in Chicago’s own Joffrey Ballet Company before moving abroad and spending many years directing and choreographing for ensembles in Germany. He has worked on innovative computer programs for dance education and even on an art exhibit shown at the University of Chicago’s Renaissance Society in 2005. His pieces are cornerstones of almost all major ballet companies’ repertoires, and his most recent works—born from the past decade he spent with his own company—are hot commodities in the dance world. In fact, the first piece of the evening, N.N.N.N., had never been performed in the U.S. despite its success abroad. So when the lights dimmed on the first audience of the series last Thursday, a hush filled the room. A single dancer stood silently on stage in athletic pants and a T-shirt. He moved his arm, amazed by gravity; he flung it, surprised when momentum carried it up to slap him in the face. He was astonished by his own body, and the audience was too. Three more dancers joined him onstage, filling the silence with the strange music of grunts and pants of exertion. They dragged, kicked, pushed, and held each other, moving at times in sync and at other times with liberty. It was chaos interrupted by moments of stillness, violence interrupted by tenderness, and earnestness interrupted by silliness. The four dancers would return to a refrain, placing their hands on each other’s stomachs in an interlaced line, seemingly correcting and joking with each other through movement. Despite the strength of all the pieces in the evening, it stood out. The second piece, Quintett, was a Forsythe classic first re-staged by Hubbard Street in 2012. The movements grew naturally within Gavin Bryar’s evocative orchestral composition Jesus’ Blood Never Failed Me Yet, which prominently features a scratchy recording of an unknown homeless man singing the song of the same name. It is not surprising that this score was initially created for a documentary. What plays out on the stage makes familiar movements seem strange and difficult ones seem easy—as much a tribute to the consistently impressive technical and artistic prowess of Hubbard Street dancers as to the choreography. Interwoven solo, duet, and trio vignettes spanned the breadth of human emotion before settling somewhere near the bittersweet. The piece closes with a single woman caught in the flickering of a projector, repeating the same dance and falling each time, only to be caught by a dancer from offstage and gently pushed back into the movement unharmed. The final piece, One Flat Thing, reproduced, was set to a wild, aggressive score by Thom Willems and performed on a stage filled with large metal tables. Fourteen brightly colored dancers slid and tumbled across and under the tables, turning and leaping in the small aisles between them, creating a whirlwind of movement. It was mesmerizing and astonishing all at once, much like the whole night. This fall series was a triumph for Hubbard Street. But for those who missed out, they can still see another show that swept Chicago off its feet. The Art of Falling, a collaboration with Second City, was Hubbard Street’s great success last year. And it will be returning to conclude this 38th season next June. After all, there are very few who do it better than Hubbard Street.